1. Fall foliage makes everything look magical. 2. 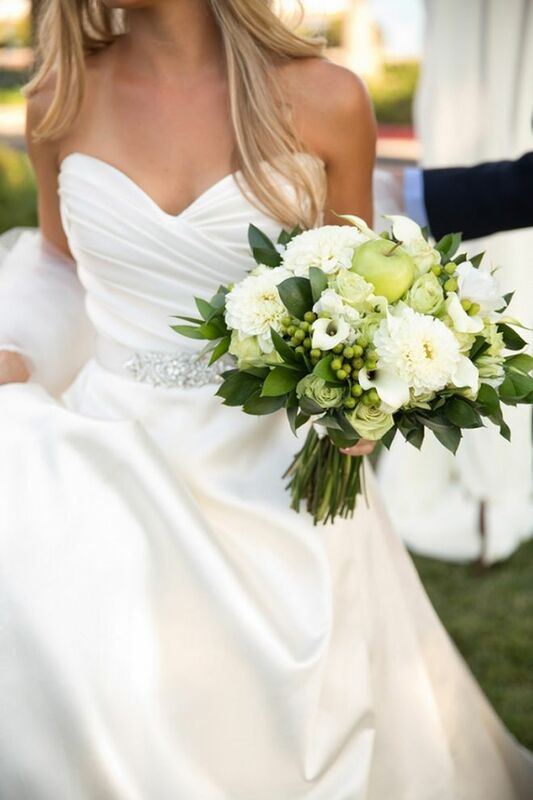 The summer heat is behind you, and the winter cold hasn’t yet arrived, which means you can have a beautiful outdoor ceremony without worrying your guests are going to melt or freeze. (Well, at least not worrying as much). 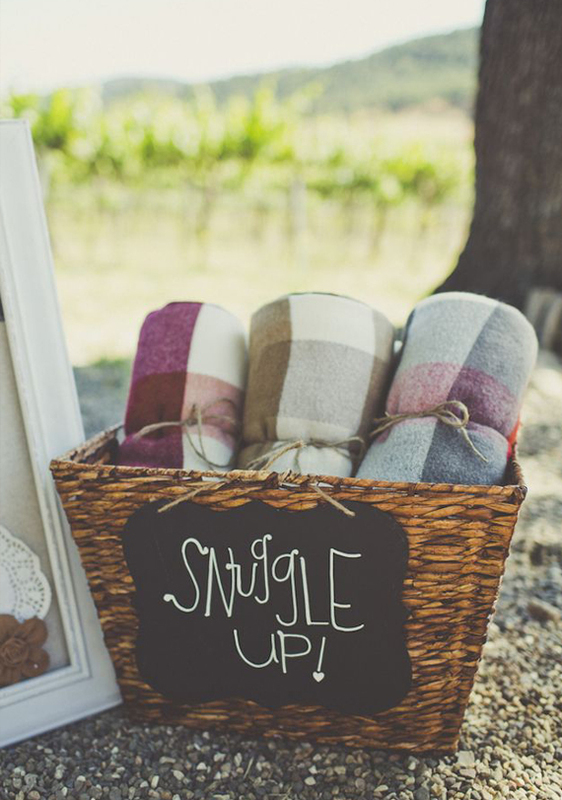 And if you want to ensure that your guests are comfortable, you can always balance things out! The possibilities are endless! 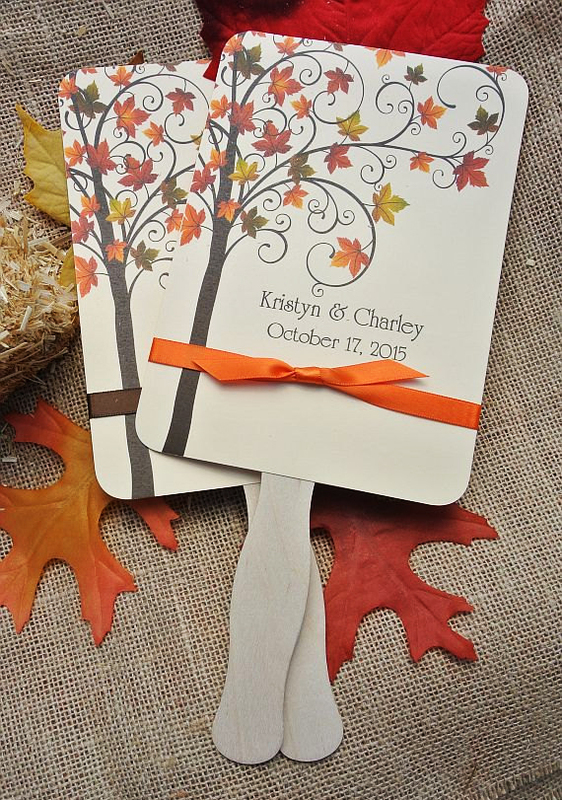 One of a kind personalized hand fans are perfect for your special fall wedding favors. By “Abbey And Izzie Designs” on Etsy. Water Refreshments Idea. More autumn ideas here. One of a kind personalized hand fans are perfect for your special favors. By “Abbey And Izzie Designs” on Etsy. 3. And your hand fan can also double as a wedding program. 6. 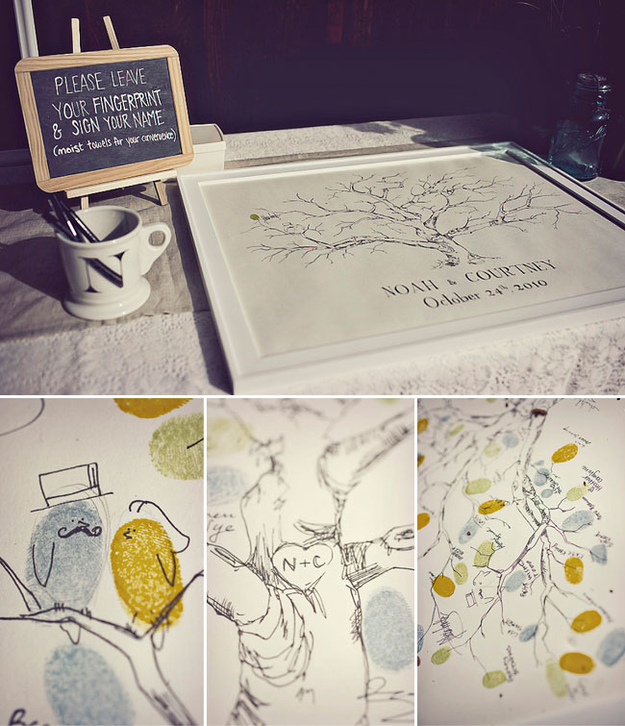 You can have your guests fingerprint a tree print instead of a traditional guestbook for a beautiful and unique outcome. 7. 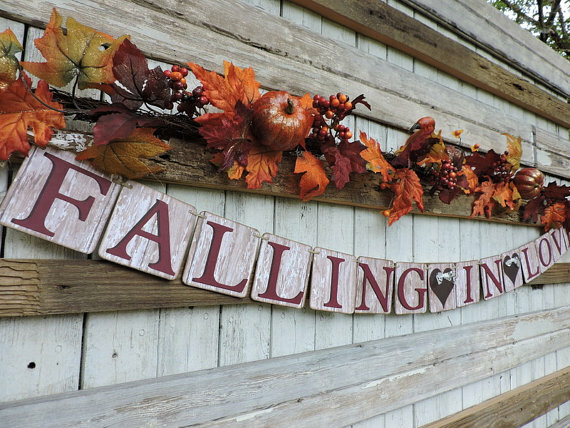 Falling in love with this beautiful rustic banner. 8. This way too adorable leaf heart detail. 9. 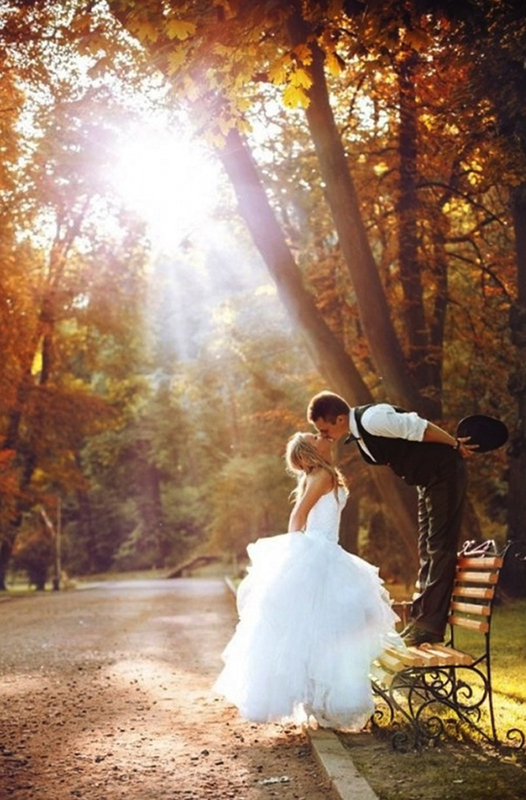 A beautiful start to your beautiful Fall Wedding. 10. Sunflowers, sunflowers and more sunflowers! 11. You can wear this beautiful hairpiece accessory. Rustic Mason Jar Light Set – by “Electric Crowns” on Etsy. $103.78 for set of 20. 14. 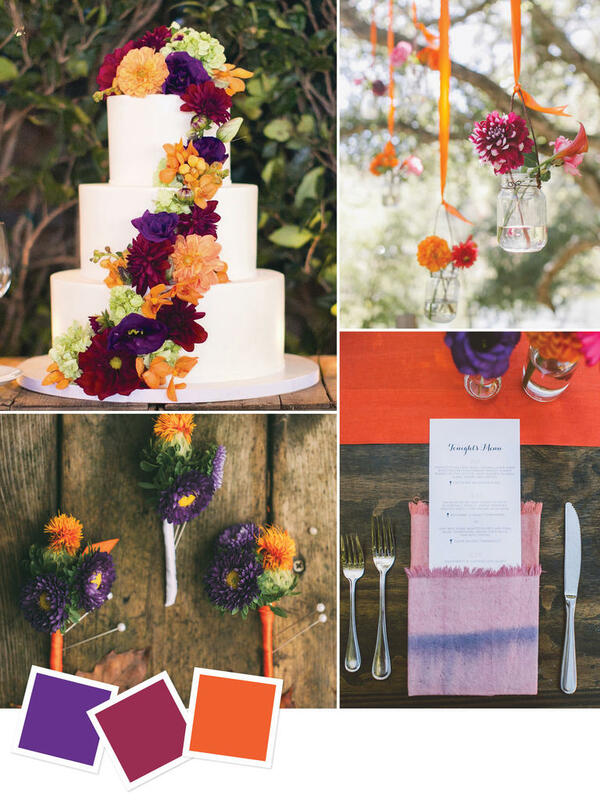 A HalloWedding is always a fun Fall Wedding idea! 15. 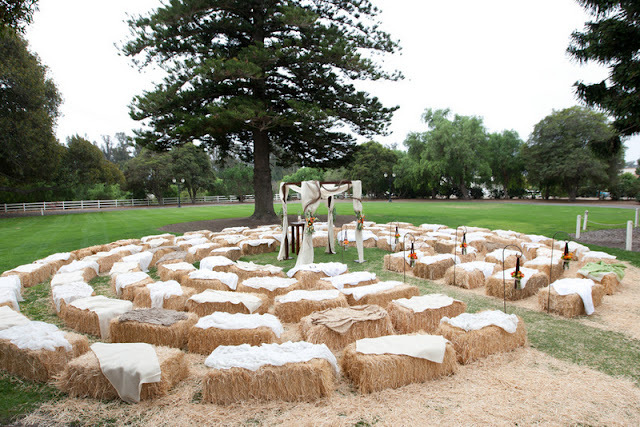 This fire pit with hay bale seating is perfect for an outdoor wedding. 16. 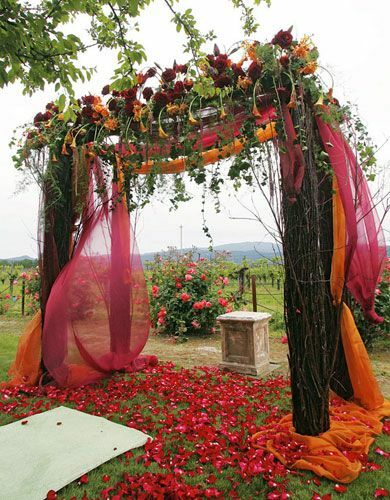 This vibrant ceremony arch. 17. A deep, dark color palette looks beautiful this time of year. 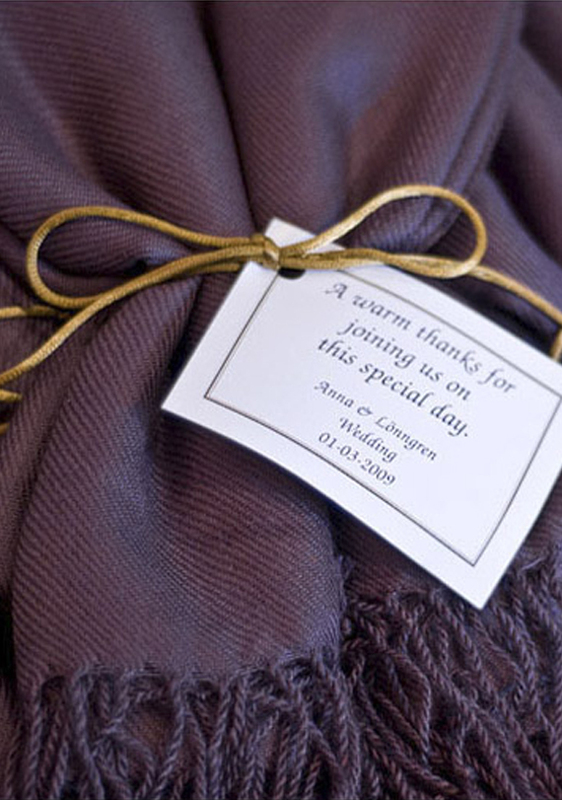 Fall In Love Can Coolers Wedding Favors – by “ThatWedShop” on Etsy. 19. 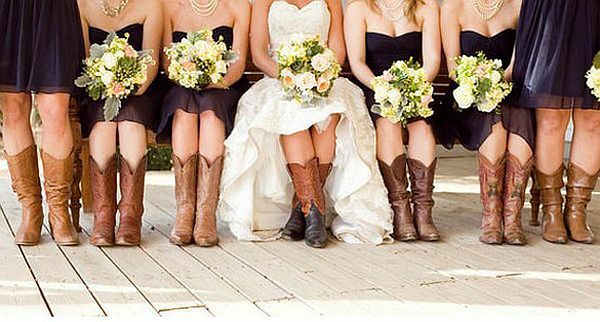 No other shoe screams “fall” quite like a good pair of cowboy boots. 20. Want the loveliest light? 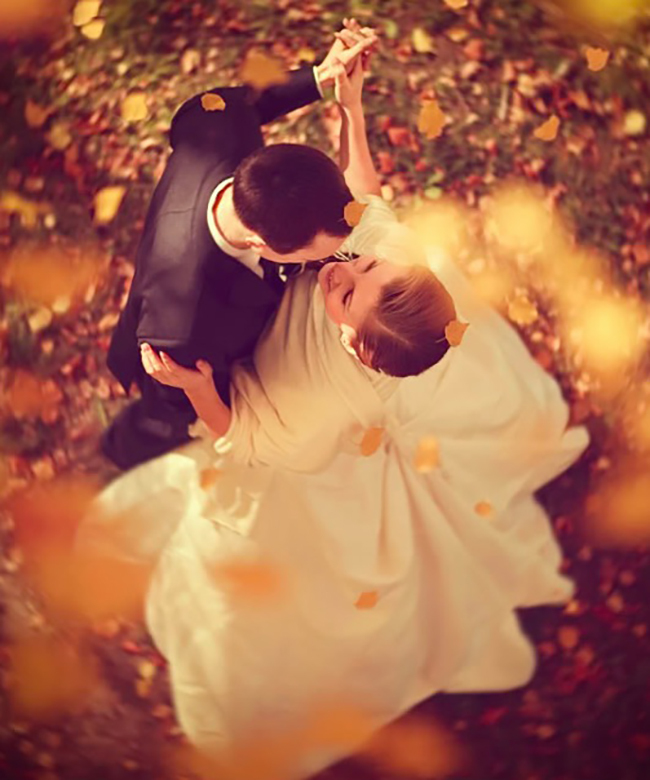 Go for an autumn wedding! Jure and Sigrun Wedding – Photography by Mark and Kara – See full shoot here. 21. And what a naturally beautiful backdrop! 22. It’s the perfect time of year for a long-sleeve gown. 23. 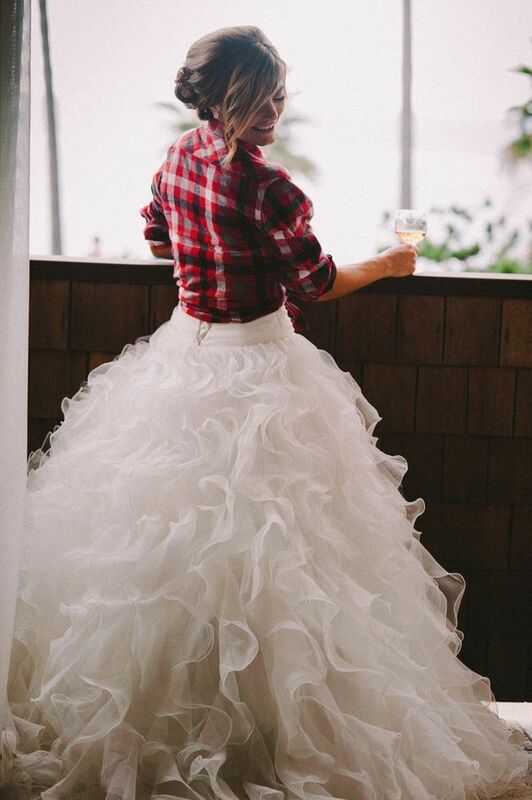 Or cover it up with your favorite plaid shirt. 24. Warm drinks are a perfect treat for your guests’ delight – and you can serve them straight “from the source”. 25. This exquisite venue for a barn style reception. 26. 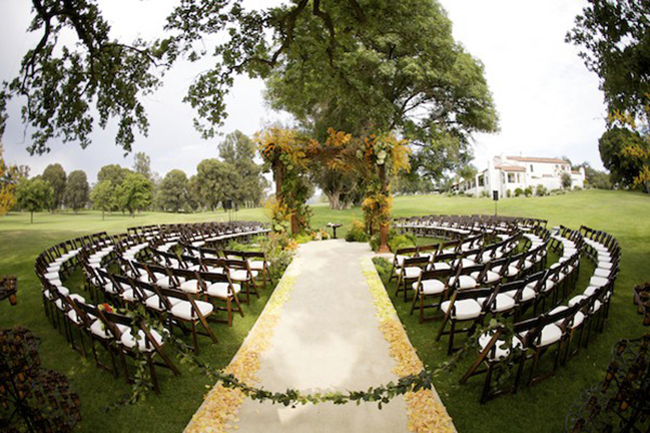 Or if you’re thinking have an outdoor wedding, this is a brilliant circular set up for the chairs so no one misses a second of your big entrance and ceremony. 27. 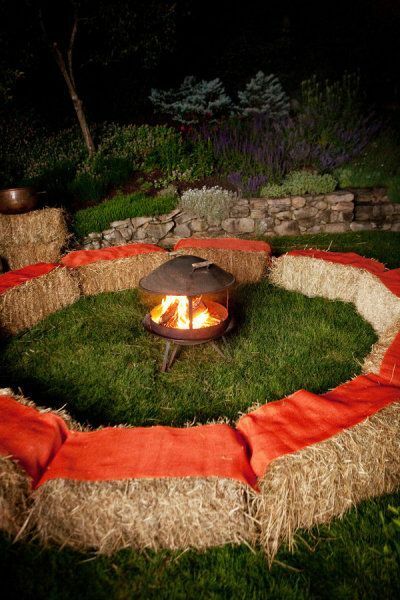 Or you can use hay bales! 28. 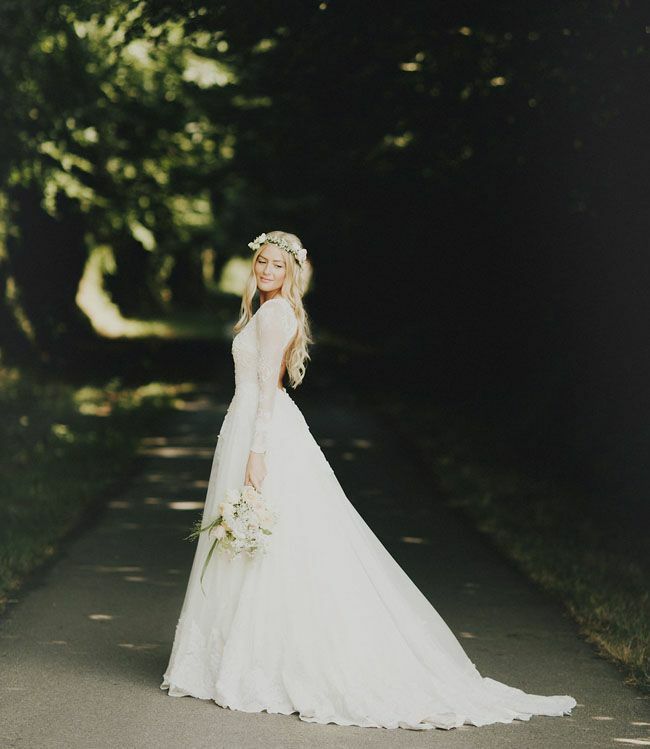 We never know which way the weather can go this time of year, so if you were planning an outdoor wedding but nature didn’t go your way, you can always bring your outdoors wedding indoors. 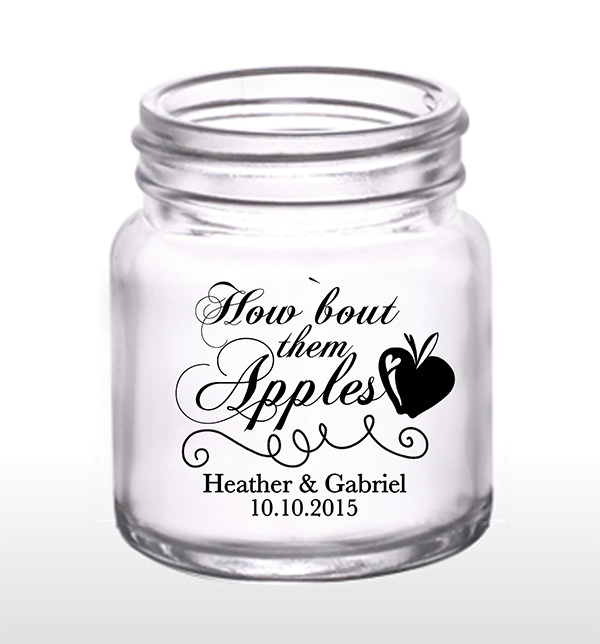 Fall In Love 1.75oz Clear Shot Glasses Wedding Favors – by “ThatWedShop” on Etsy. 32. Or these 2oz mini mason shot glasses version. 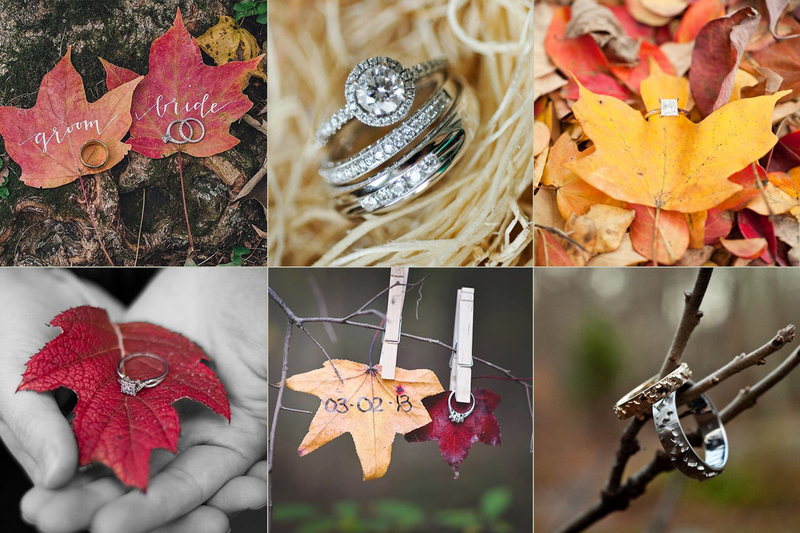 Fall In Love Mini Mason Shot Glasses Wedding Favors – by “That Wedding Shop” on Etsy. Lids available. 33. And matching wedding signs to complement the look. Super easy Instant Download to print-at-home! 36. Sparkles fly when two people Fall In Love. 39. This boutonniere is more than adorable. 41. 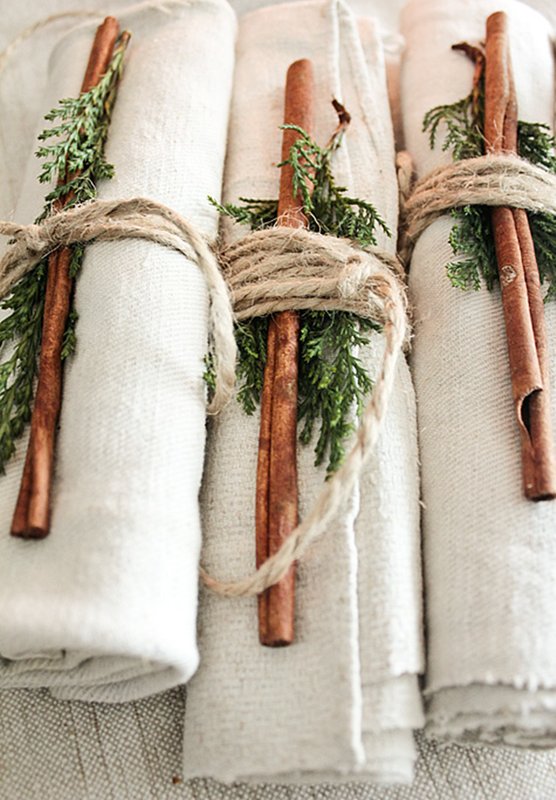 These simple, but yet charming centerpieces. 43. This Burlap and Lace Rustic Vases are a exquisite touch to your decor. 44. You can have the loveliest mini pinecone seating place holders. 45. 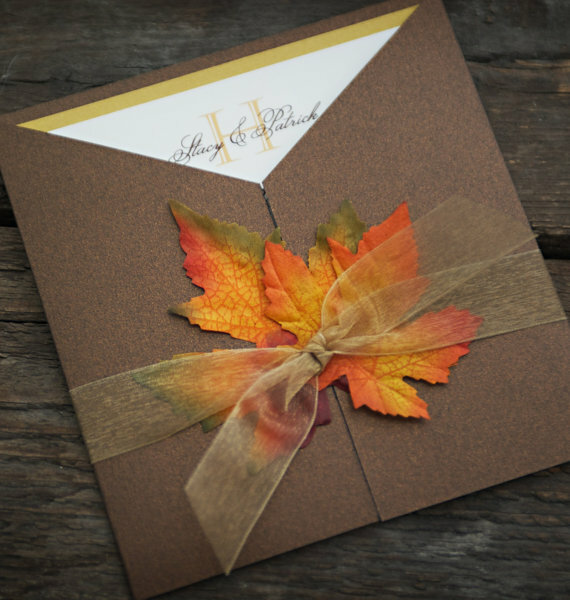 Or add a rustic touch with a glamorous twist to your fall wedding with these golden leaves DIY place cards. 46. 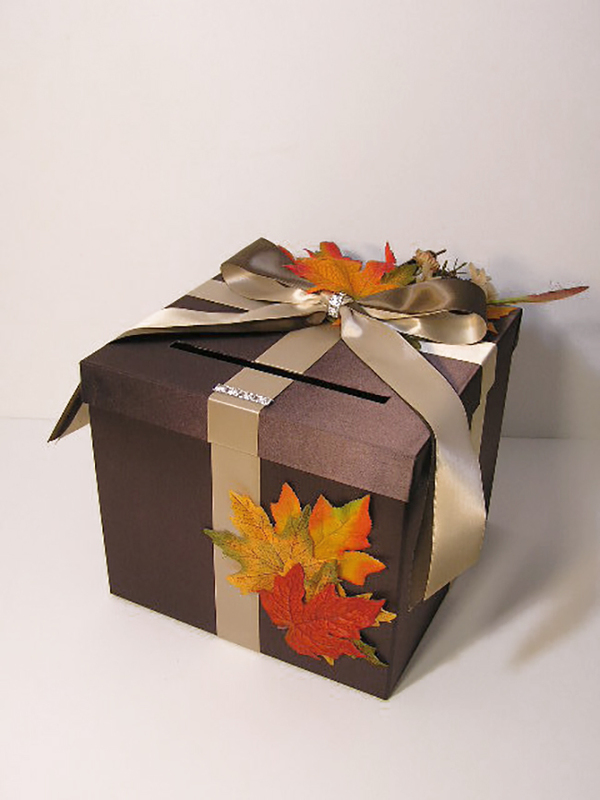 This enchanting gift card box perfect for the season. 47. Toast your big day with this delicious cider mimosa. Cider Mimosa Autumn Wedding Cocktail – Recipe here. 48. Dance the night away! 50. 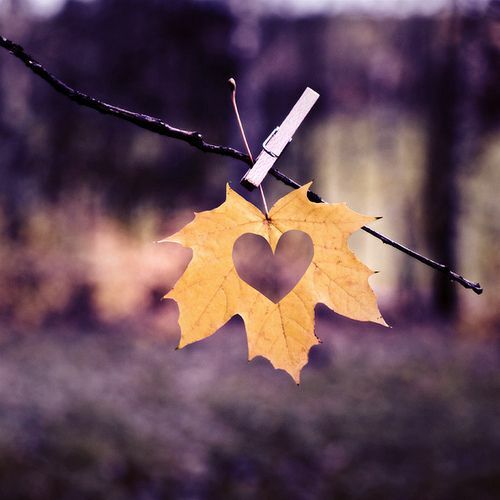 But if you must fall… Fall In Love! Or subscribe to our Newsletter at the bottom of the right side menu and be the first to know what we are up to! Stay tuned! 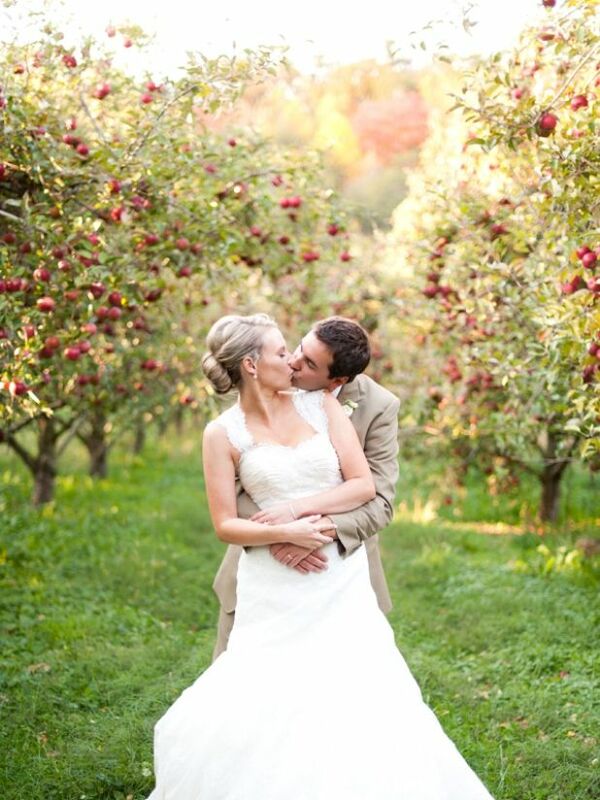 25 Apple-themed Wedding Ideas – Perfect for a Fall Wedding! 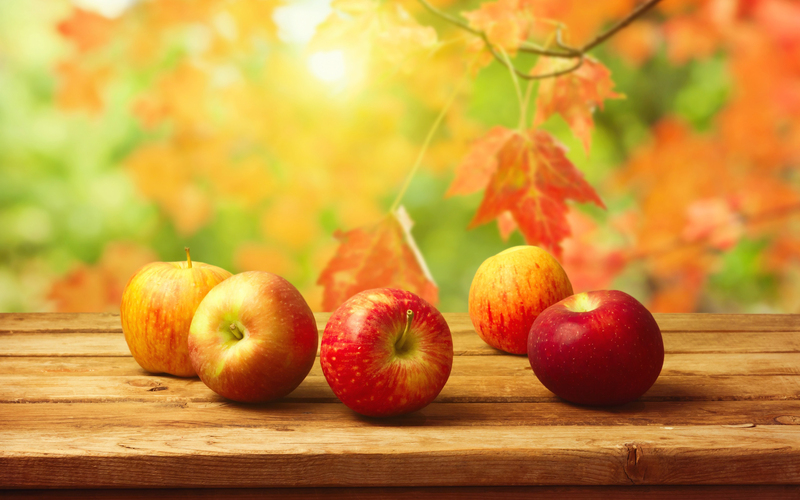 Nothing says fall quite like the smell of fresh apples. 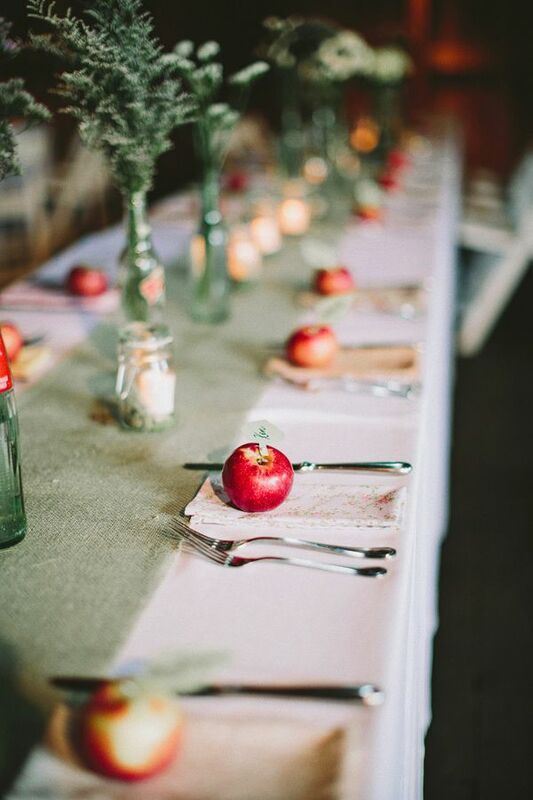 To celebrate the season, we’ve pulled together some of our favorite ways to include apples in your wedding. 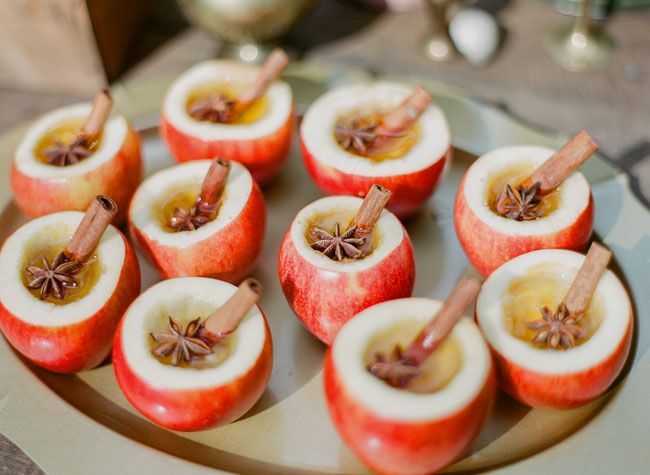 Here are 25 Apple-Themed Wedding Ideas that are perfect for your Fall Celebration! 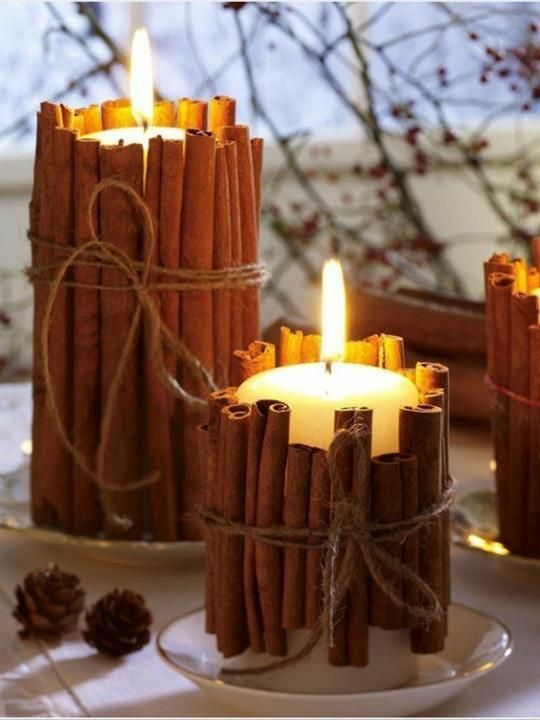 Apples Candles Autumn Wedding Idea – Learn how to make them here. 2. 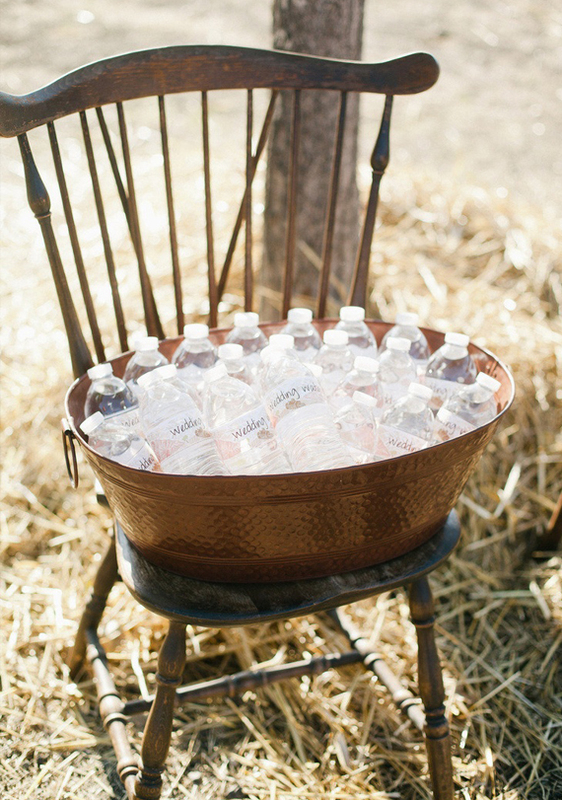 You can also have them in a tub for a rustic outdoors wedding. 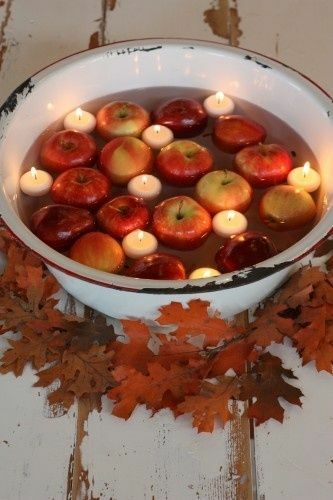 Apples Candles Autumn Wedding Idea – Click here for more Fall Wedding Ideas. 3. 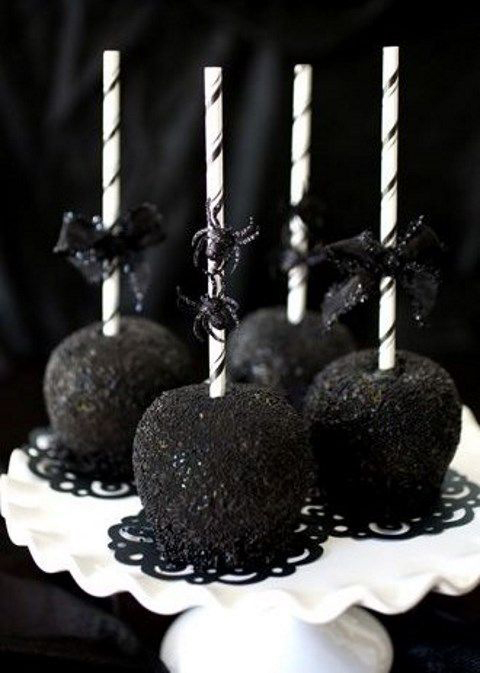 If you have mini apples, these floating candles are also a simple and beautiful touch. 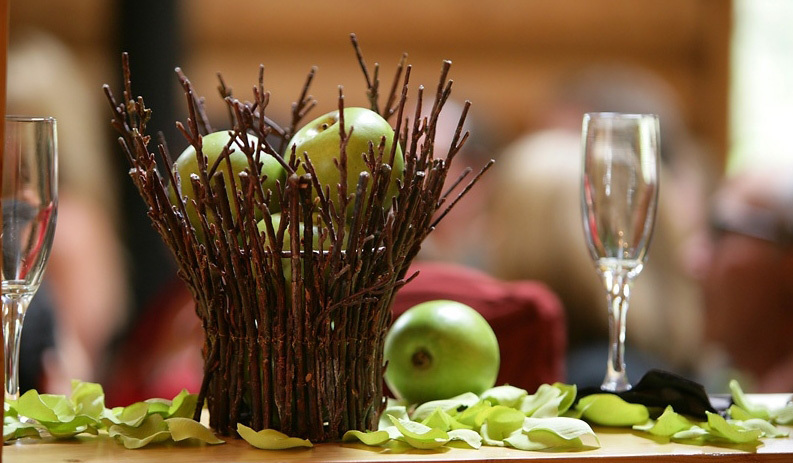 Apple Floating Candle Centerpiece Fall Wedding Decoration Idea. 4. 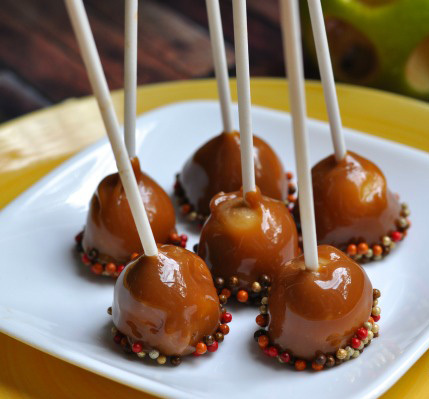 Classic caramel apples for your guests. 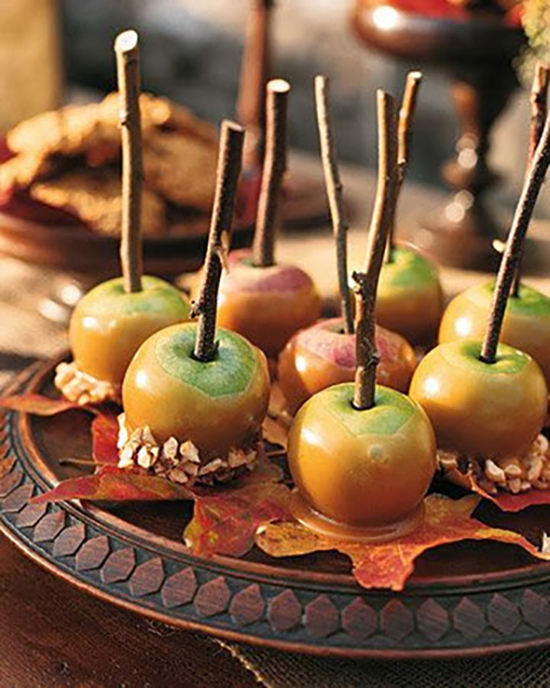 Classic Caramel Apple Fall Wedding Edible Favor – Learn how to make them here. 5. And here is the Halloween Wedding version. 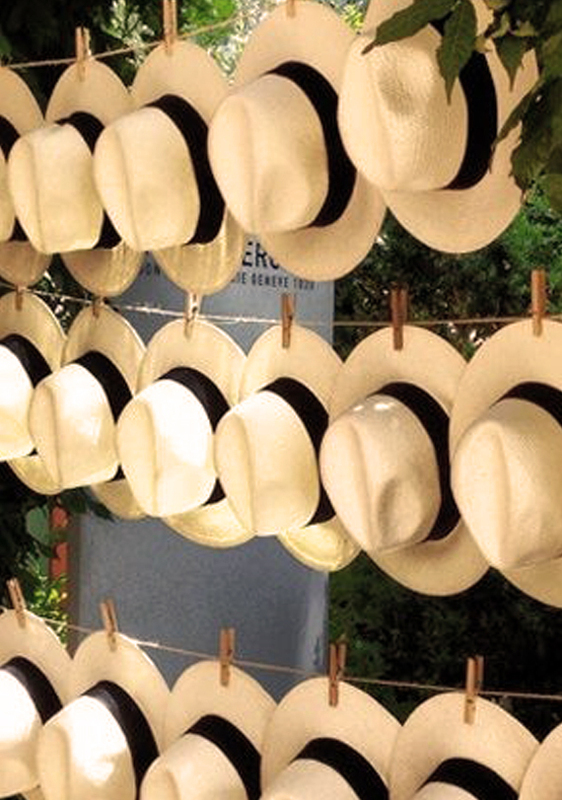 Difficulties: Medium Prep Time: 15 min Total Time: 40 min – Learn how to make them here. 6. And the mini version. 7. 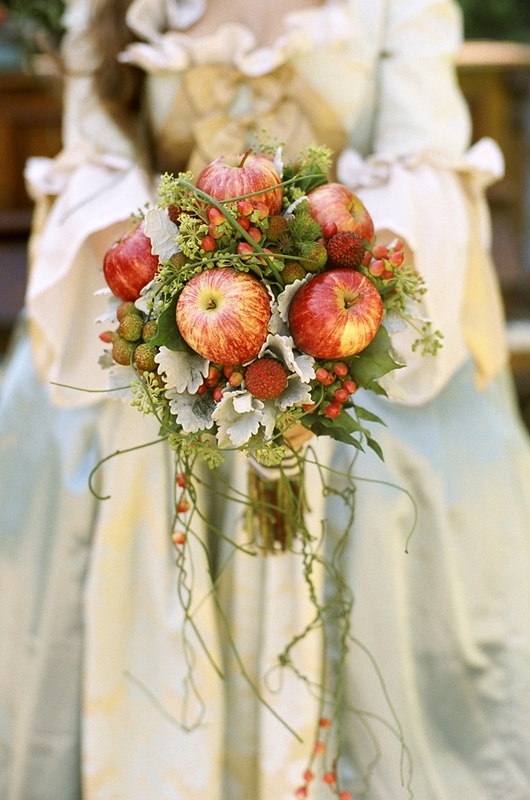 A beautiful red apple bouquet – Perfect for the season! 9. A special kind of “Flower” Girl. 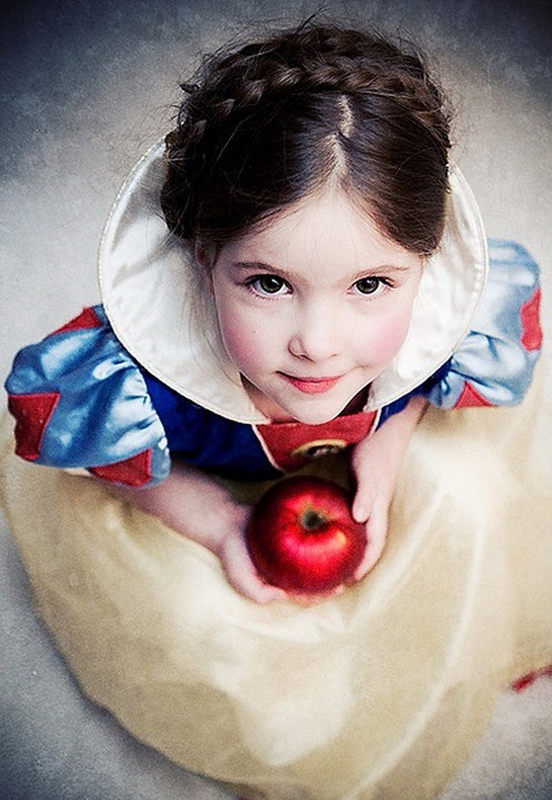 Adorable Apple “Flower” Girl with Snow White Costume Fall Wedding Idea. 10. 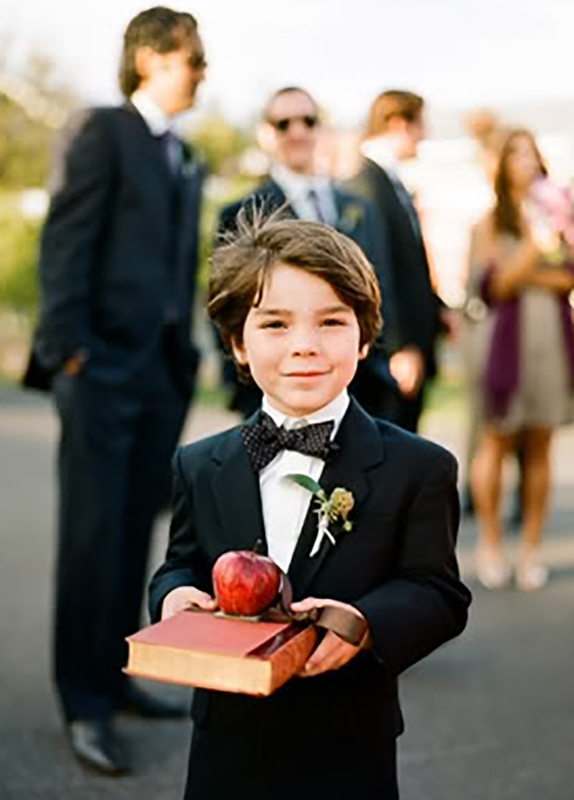 And let’s not forget about your ring bearer. 11. Wedding rings photo possibilities are endless. 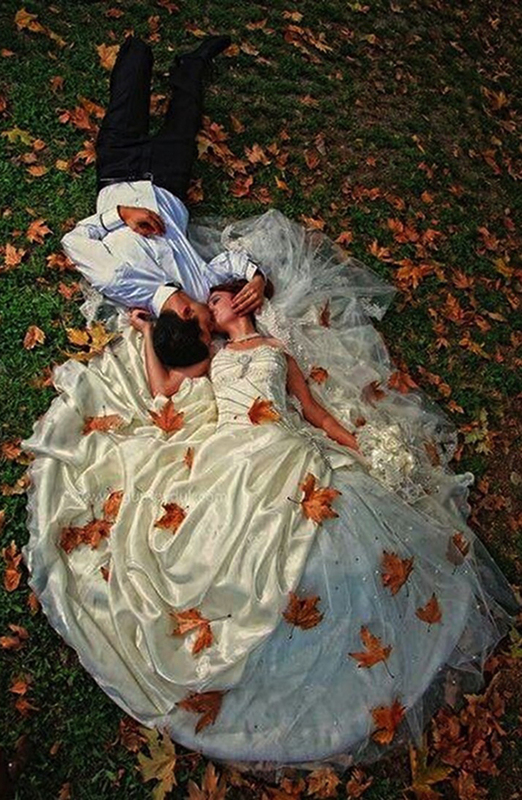 See more engagement photo ideas here. 12. 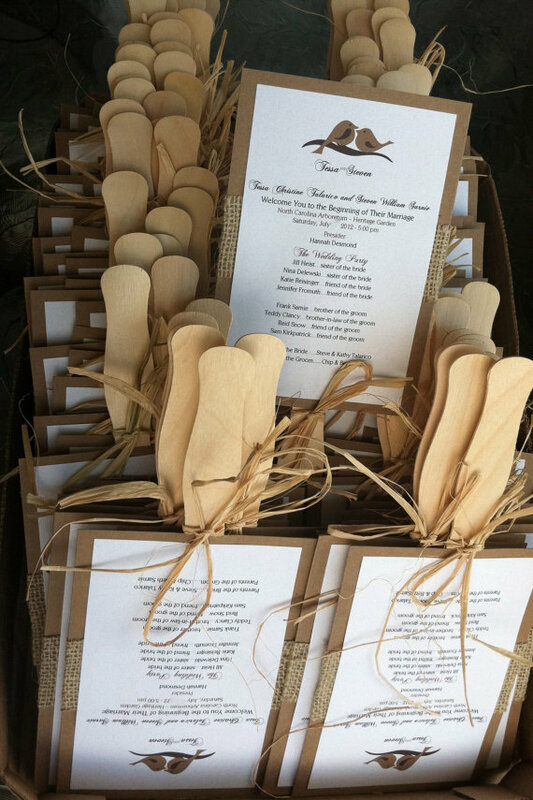 They also make delicious place card holders. 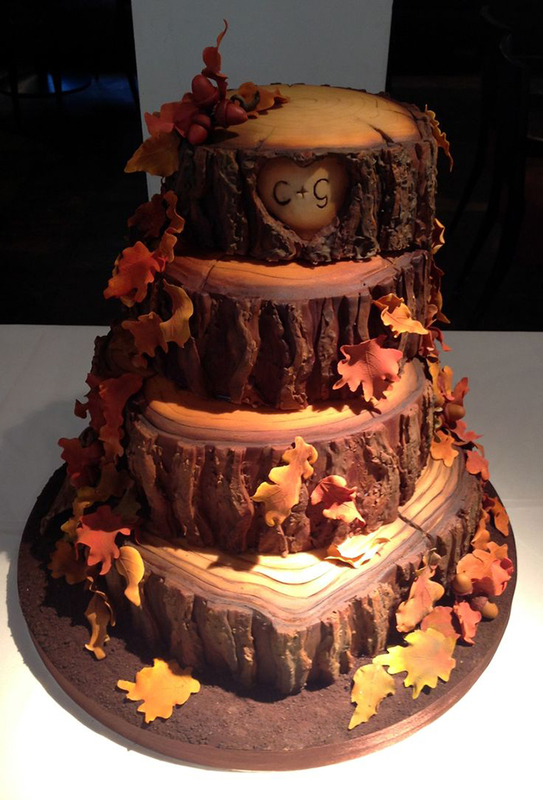 Beautiful Fall Wedding Cake decorated with apples. 14. Apple cider punch from a pretty dispenser. 15. Or straight out of the apple! 17. These mini mason jars. How ‘Bout Them Apples 2oz Mini Mason Shot Glasses. By “My Custom Wedding” on Etsy. $195 for 100 units. Other quantities and colors available – Lids upon request. 18. 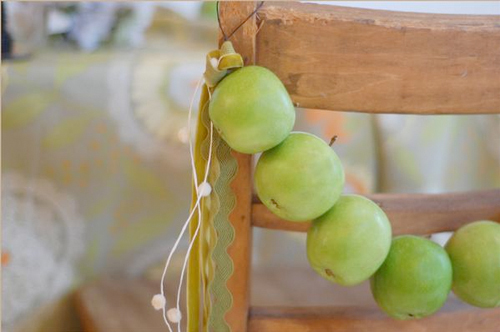 These green apple lip balm wedding favors. 19. Creative Apple Ceiling Decor. 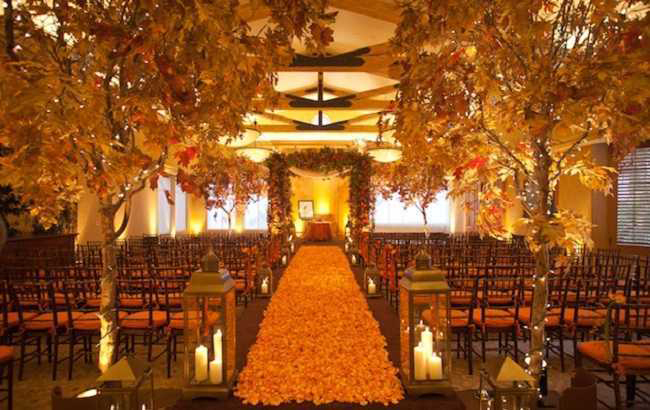 Creative Fall Wedding Venue Ceiling Apple Decoration Idea. 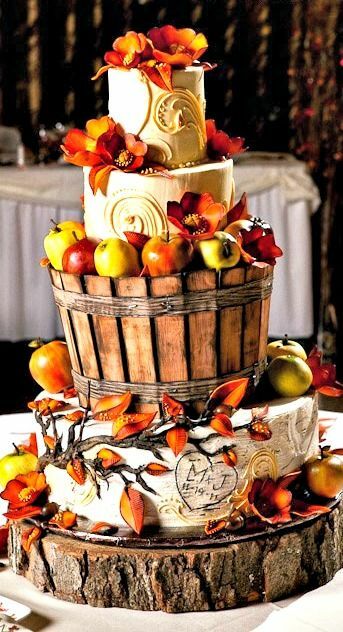 Apple Rustic Centerpiece Fall Wedding Idea. 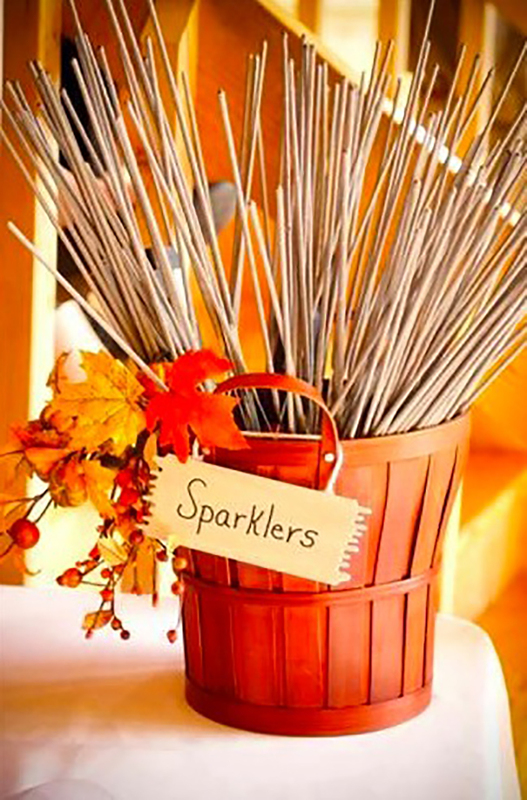 Creative chair decoration idea for Fall Weddings. 22. Beautiful apple decoration for your outdoors bar. 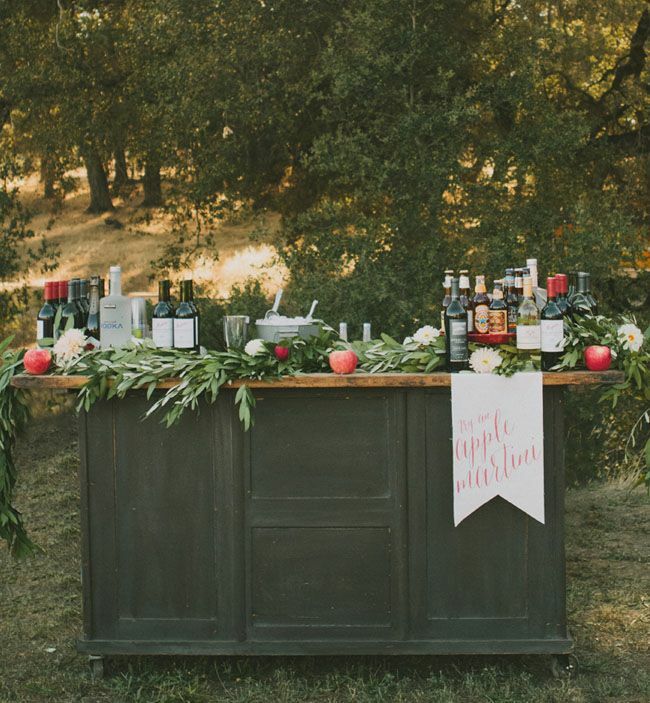 Beautiful apple decoration for your outdoors bar. 23. This succulent table of apple treats. 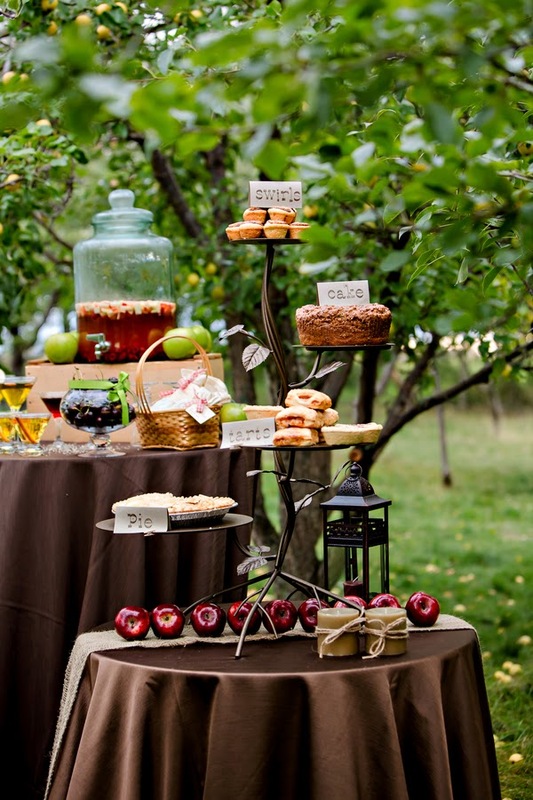 Table with delicious apple treats – Perfect for your Fall Wedding. Apple Roses Video Tutorial – Perfect for Fall Apple-Themed Wedding Treats!